The first building you'll see in Lilycove City is the Contest Hall, for Master Rank contests. You need a Ribbon in each of the Normal, Super and Hyper contests in order to compete here. In Emerald, players find all of the contest ranks here for easy access. 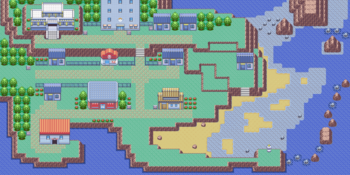 Climb the stairs to the right of the Pokémon Center to get up to the Lilycove Department Store. Before you can get inside the Department Store, you'll have to battle your Rival again. The house to the right of the Dept. Store is home to the Move Deleter, who can help any Pokémon unlearn a move. He is the only person who can delete HM moves. If a strong Pokémon of yours knows an unwanted HM move, bring it here.